As I have mentioned before, I was privileged to co-chair the previous NCTE (National Council of Teachers of English) Committee that presents the Excellence in Poetry for Children Award. That committee has the responsibility for selecting the recipient of the award for the most outstanding children’s poet every three years. We were thrilled to be able to choose Nikki Grimes as the 2006 recipient of this award. 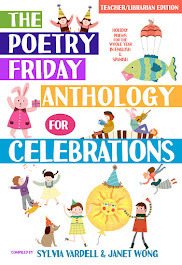 However, the committee is also charged with “exploring ways to acquaint teachers and children with poetry.” One way of doing that is to highlight the wonderful poetry being published for children each year, calling attention to new titles and new poets that children are sure to enjoy. Thus, our committee decided to highlight some of the best poetry books published during our committee’s three-year tenure, 2003-2006. 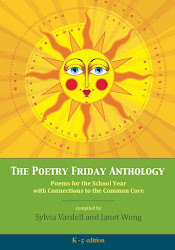 We worked together to select the 10 best poetry books published during each of those three years, based on the criteria for excellence for the award itself: literary merit, imagination, authenticity of voice, evidence of a strong persona, universality and timelessness, and appeal to children. 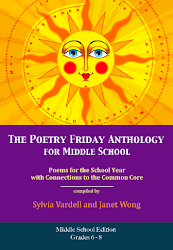 The complete and annotated list of these 30 poetry books is now available in the July issue of the NCTE journal, Language Arts. The full text version is accessible online to subscribers here. Vardell, S.M., Oxley, P., Heard, G., Kristo, J., Spivey, G.W., Wong, J., and Woolsey, D. (2007). 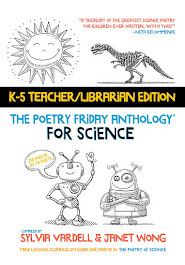 Best poetry books for children 2003-2006. Language Arts. 84, (6), 552-557. Happy birthday, Paul B. Janeczko! Former English teacher Paul Janeczko began compiling poem anthologies for his students in the 1970’s which led to more formal publication of many, many anthologies for teens and children, as well as poetry of his own in the years since. He has also written books for teachers on using poetry and poetry writing in the classroom and is now a frequent speaker and workshop leader. Janeczko’s work has been recognized with many awards and “best” list citations, including the American Library Association Books for Young Adults, American Library Association Notable Books, New York Public Library Best Books, School Library Journal Best Young Adult Books of the Year, among others. As a response activity, children may enjoy discovering unusual forms of poetry or even trying their hands at writing them. Or working as a group, children can create their own alphabet book of poetry with each child responsible for a letter to build a poem upon. Other Janeczko anthologies that offer additional guidance to budding poets include Seeing the Blue Between: Advice and Inspirations for Young Poets (Candlewick, 2002), The Place My Words Are Looking For: What Poets Say About And Through Their Work (Bradbury, 1990), and Poetspeak: In Their Work, About Their Work: A Selection (Bradbury, 1983). For more information about Janeczko and his work, look for Poetry People; A Practical Guide to Children's Poets (Libraries Unlimited, 2007). Yesterday, July 19, was poet Eve Merriam’s birthday. Despite her publishing fresh and engaging poetry for children for over thirty years, I find many young people don’t regularly encounter her work any more. And that’s a shame. I’d like to take this moment to highlight some of my Merriam favorites (and share an excerpt from my book Poetry People about her). Eve Merriam began writing poems at age seven. As a teenager, she wrote poems for her high school magazine and newspaper. Merriam began her career as a copywriter and later as a radio writer for Columbia Broadcasting System and other networks. She also worked as a fashion copy editor and then as a free-lance magazine writer, book writer, and poet. In her later career, Merriam focused on writing adult plays. She was a frequent speaker and promoter of poetry for young people and was honored with the National Council of Teachers of English Award for excellence in poetry for children for her entire body of work. Check out The Singing Green for a sampling of several of Merriam’ poems from previous out-of-print collections, including “The Poem as a Door,” one of several poems Merriam has penned that try to describe what poems are and how poets create poetry. Look for other Merriam poems about poetry such as “Where is a Poem?” from There is No Rhyme for Silver, “How to Eat a Poem” from A Sky Full of Poems, and “’I,’ Says the Poem” from A Sky Full of Poems. 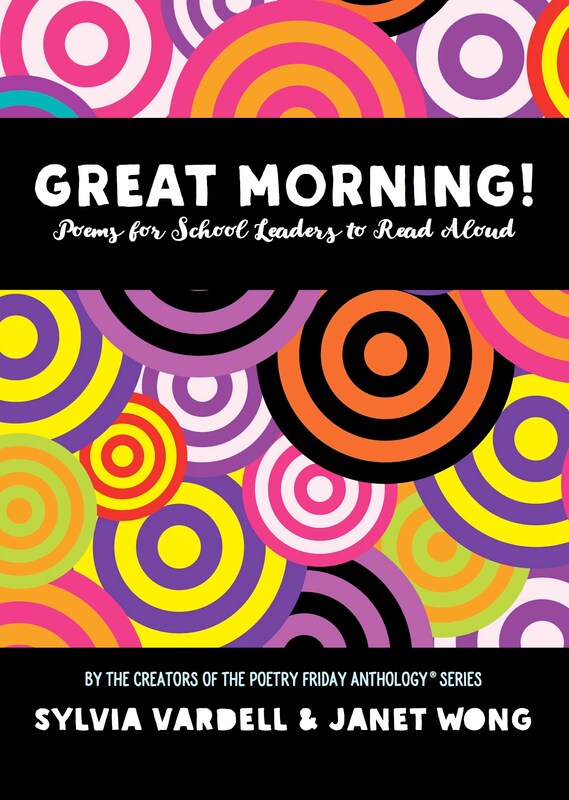 These gems are often included in general poetry anthologies and are wonderful examples to introduce a poetry lesson or label the poetry book area. I’m tickled pink to celebrate the one year anniversary of my blog! My first entry set my purpose: to “explore what's new in the field of poetry published for children and young adults.” And my first entry was also a shameless plug of a new book I wrote to promote poetry with young people entitled, Poetry Aloud Here, a practitioner's guide to sharing poetry with children (ages 5-12) in ways that are fun, meaningful and participatory. Well, brace yourself for more brazen self promotion. 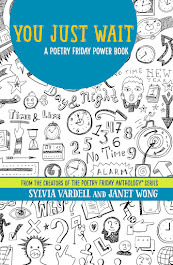 I’m pleased to announce I have published another resource to help with promoting poetry with kids entitled, Poetry People; A Practical Guide to Children’s Poets (available now from Libraries Unlimited). 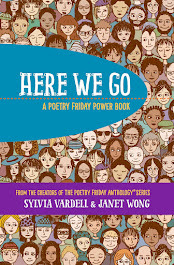 This new book provides a comprehensive introduction to more than 60 contemporary poets writing for young people, from Arnold Adoff to Douglas Florian to J. Patrick Lewis to Naomi Shihab Nye to Gary Soto to Janet Wong, and many more. 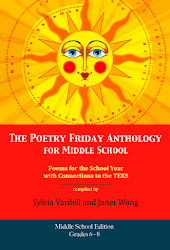 The entry for each poet includes brief biographical information, highlights selected poetry books authored, showcases awards won, notes related web sites, and provides suggestions for making connections (programming ideas, related books, and activities across genres). 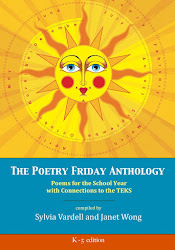 Additional supplementary information is also provided, including further lists of poets to know, awards for children’s poetry, helpful poetry web sites, a list of poems about libraries and reading, recommendations of must-have poetry anthologies, a poetry practices checklist, tips for poet promotion activities, and a calendar of poet birthdays to celebrate month by month. Poet and anthologist Lee Bennett Hopkins calls it a “poetry treasury” and a “readable, useful, not-to-be-missed resource… a reference volume that will leap from the shelves.” Thank you, Lee! 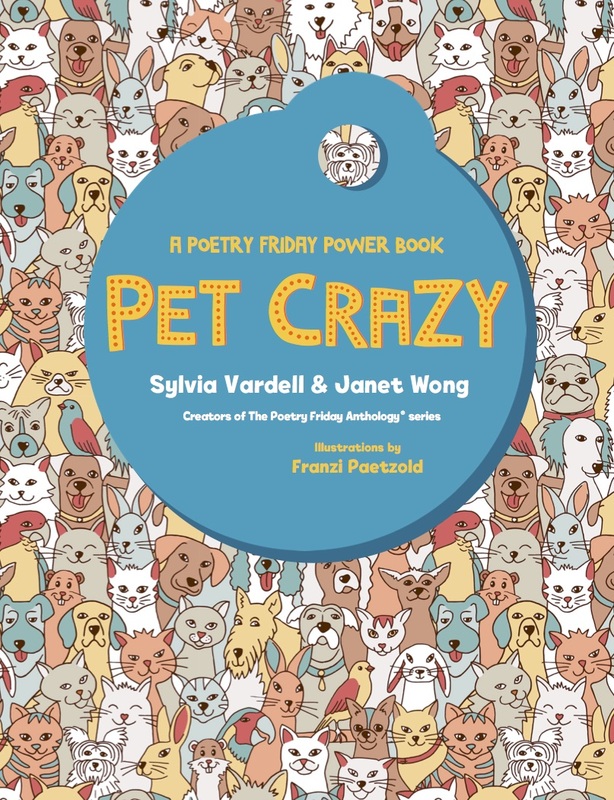 If you’re looking for more help in promoting poets or simply want to familiarize yourself with many of the wonderful poets writing for children today, I hope you’ll check it out. And I welcome any input on the blog as a whole, especially any suggestions or questions for future content. Thanks for stopping by! Happy birthday to my friend and poet, Rebecca Kai Dotlich who was born on July 10 in Indianapolis, Indiana. She is also a featured poet in my new book, Poetry People Here is an excerpt from my piece on her and her work. She grew up in Indiana in the backyard of the Indy 500 and attended Indiana University. She began writing even as a young child on a toy typewriter and eventually published her first collection of poetry for children, Sweet Dreams of the Wild, in 1995. She is a mother and grandmother, as well as a frequent conference speaker and writer-in-residence in the schools. In addition, she has been a poetry advisor for Creative Classroom magazine. Rebecca Kai Dotlich has a particular talent for writing poetry for our youngest readers and listeners. Dotlich has two collections that are full of movement, in their strong rhythms and in their content. Over in the Pink House: New Jump Rope Rhymes (Boyds Mills Press, 2004) includes 32 original rhymes for chanting aloud while jumping rope. With In the Spin of Things: Poetry of Motion (Boyds Mills Press, 2003), Dotlich finds movement in ordinary things like ice cubes, pencil sharpeners, etc. Both books are full of playfulness with words and actions. Combine them with Jane Yolen's Street Rhymes around the World (Wordsong, 2003) and Joanna Cole's Anna Banana: 101 Jump-Rope Rhymes (HarperTrophy, 1989) for more playtime rhymes. Other jump-rope resources include The Jump Rope Book by Elizabeth Loredo and Martha Cooper (Workman, 1996), Double Dutch: A Celebration of Jump Rope, Rhyme, and Sisterhood by Veronica Chambers (Hyperion/Jump at the Sun, 2002). And of course, be prepared for spinning, jumping among the children and have the jump ropes ready. For … summer gatherings, share Dotlich’s Lemonade Sun: And Other Summer Poems (Boyds Mills Press, 1998). She captures childhood experiences with metaphorical language that focuses on natural pleasures like enjoying butterflies and ladybugs, as well as games of jacks and jump rope. Once again, children will enjoy DOING these summer activities or sharing about their favorite summertime pastimes. Brainstorm a group list of favorites and encourage children to try new ones. Other summer poetry can be found in July is a Mad Mosquito by J. Patrick Lewis (Atheneum, 1994), Turtle in July by Marilyn Singer (Macmillan, 1989), and From the Bellybutton of the Moon and Other Summer Poems/ Del ombligo de la luna y otros poemas de verano by Francisco X. Alarcón (Children's Book Press, 1998). Look for more from Rebecca Kai Dotlich, a gentle, thoughtful, playful poet to watch! Today is my son’s 19th birthday and I am sending a shout out to him to wish him every good thing today and always. He is a wonder to me, a young man grown out of my blonde angel baby; a serious, loyal friend emerging from a playful toddler marching to his own drummer; a smart and thoughtful son from the ticklish baby I carried to Africa and back. Happy birthday, Alex. I look forward to watching what you will be and do next. Here’s a poem to guide you on your way. From: Schmidt, Gary D., ed. 1994. Poetry for Young People: Robert Frost. Illus. by Henri Sorenson. New York: Scholastic. 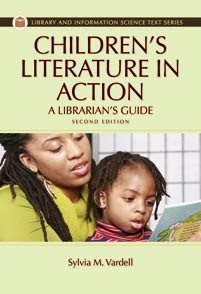 ISBN 0439254191. FYI: An audio reading of the poem is also available here.